At Metals Depot we carry a selection of Metal Pipe composed of steel, aluminum, and stainless steel. Depending upon the material selected, these pipes are used in a full range of applications including frame work, braces, supports, gates, handrails, roll cages, truck racks, and more. 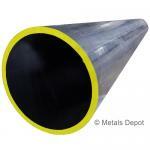 All our metal pipe products are available in various lengths ranging from 2 feet to 21 feet or custom cut to size. No order is too large or too small. When light weight and corrosion resistance are needed, this extruded aluminum pipe is frequently used. Some of its applications include frame work, support columns, gates, fencing and handrails. Aluminum pipe is easy to cut, weld, form, machine and thread. Shop for Aluminum Pipe Online! 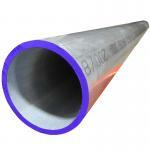 Shop for Galvanized Pipe Online! Shop for Polished Stainless Pipe Online! Stainless Steel Pipe is the product of choice when greater strength and corrosion resistance are needed. Its durable finish is ideal for fabrication projects where exposure to the elements - chemical, acid, natural and salt water - is an issue. Welded stainless steel pipe is suited for frame work, braces, supports, and marine work. Shop for Stainless Steel Pipe - 304 Online! Shop for Steel Pipe Online!